Single mother Lára struggles with her little son to keep up with life and grasps an opportunity to be employed as border guard trainee. African refugee Adja tries illegally to reach Canada with her daughter. When their lives cross at the passport control, neither of them realizes the extent to which they will alter the course of each other’s destiny. A powerful socio-critical drama about life on the fringes against the backdrop of the stark Icelandic landscape and imigrancy. Lara (Kristín Thóra Haraldsdóttir) is no stranger to struggle. We first see her short of money to pay for her supermarket shop. A single mother, raising her son Eldar (a delightful, scene-stealing Patrik Nökkvi Pétursson), she is faced with mounting debts and diminishing resources. Hope arrives in the form of a job with the passport service at Keflavík airport. It is only Lara’s vigilance that spots the false passport of Adja (Babetida Sadjo), a female refugee from Guinea-Bissau who claims to be French and travelling alone to Toronto. Adja is detained and disappears into a system with rules, procedures and regulations that must be followed regardless of personal sympathies. You are left with the sense that Lara regrets her intervention almost as soon as it has been made. In such a small community, it seems inevitable that the two women will meet again and the events that nudge them together are plausible. The more the story unfolds, the more we gain a better understanding of who these characters are and what they have endured to try and build a decent, secure family life. Major revelations are handled with subtlety and discretion. 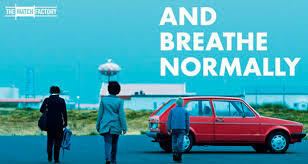 Set in a bleak, chilly Iceland where you can hear every howl of wind and splatter of raindrops, And Breathe Normally touches on a number of issues from the treatment of refugees to LGBT rights. It carries those concerns lightly, however, and remains solidly focused on the two women. Kristín Thóra Haraldsdóttir paints Lara as a woman intent on doing the right thing even though it could be easier for her to simply walk away or ignore a situation. Lara is imperfect and makes some questionable decisions but we never doubt her good heart. Initially, Adja is a less well-defined, more mysterious figure. Babetida Sadjo plays her with dignity and a sense of someone who has learnt the wisdom of keeping her true feelings under wraps. Adja is careworn but unbowed and has retained her compassion for others. It is the innate decency of both women under trying circumstances that cements the bond between them and lends the film a warming sense of hope.